Liver-on-a-chip cell culture devices are attractive biomimetic models in drug discovery, toxicology and tissue engineering research. To maintain specific liver cell functions on a chip in the lab, adequate cell types and culture conditions must be met, which includes 3D cell orientation and a consistent supply of nutrients and oxygen. Compared with conventional 2D cell culture techniques, organ-on-a-chip devices offer versatility and effective biomimicry suited for advanced applications in drug discovery and medicine. In a recent study now published on Biofabrication, Jonas Christoffersson and colleagues demonstrated how hydrogels that mimic the extracellular matrix can support the functionality and viability of hepatocytes in a perfused liver-on-a-chip device. 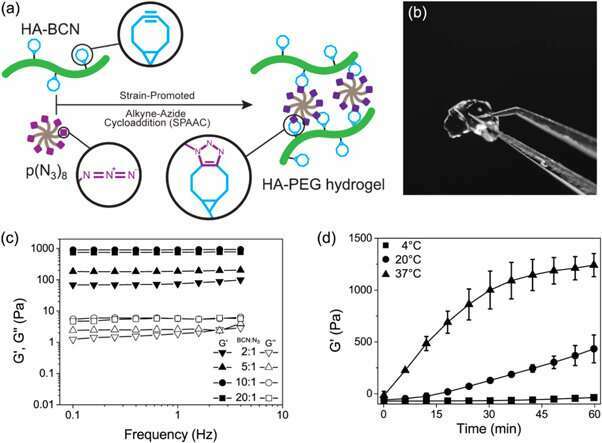 The interdisciplinary researchers in the division of biotechnology and molecular physics engineered a hydrogel system based on hyaluronan and poly(ethylene glycol) (HA-PEG) polymers. They developed the hydrogels using click chemistry. To enable the process, the scientists conducted a biorthogonal reaction (chemistry that occurs within living systems without the interference of native biochemical reactions) between a cyclooctyne moiety and alkyne azide-labelled reaction partner, known as strain-promoted alkyne azide cycloaddition (SPAAC). The new hydrogel materials were engineered and characterized in comparison with existing agarose and alginate hydrogels for cell compatibility (cytocompatibility). For biofunctionalization studies, the researchers used human induced-pluripotent stem cell derived hepatocytes (hiPS-HEPs). To improve surface cytocompatibility of the biomaterial, HA-PEG hydrogels were altered with azide-modified cell adhesion motifs to facilitate effective cell-material attachments. In the surface functionalized biomaterial, the hepatocyte stem cells migrated and grew in 3D orientations, with increased viability. The scientists observed higher albumin production on the novel material (characteristic liver protein), compared to cells cultured on other hydrogels. The flexible, SPAAC crosslinked hydrogel system with perfused 3D cell culture of hiPS-HEPs is a promising material to optimize liver-on-a-chip devices. Miniaturized bioreactors known as 'organ-on-chips', have recently emerged as alternative cell culture models that better mimic the in vivo biological microenvironment in the lab. The liver is a model of special interest in medical research due to drug hepatotoxicity observed at all phases of clinical drug development. Previous publications detail the use of organ-on-chips to predict the outcome of a drug's impact in clinical trials and evaluate drug interactions with hepatocytes in the lab. Due to their wider adoption in academic and industrial settings, the bioreactors require optimized materials and conditions for high throughput fabrication. Conditions include replacing the common prototyping material polydimethylsiloxane (PDMS), integrating induced pluripotent stem cell (iPSC)-derived cells on a soft biomaterial that facilitates their growth and minimizing the large dead volume caused by microfluidics reservoirs and tubing of organ-on-chips devices. The novel biomaterial prepared in the study contained two main constituents crosslinked via SPAAC; a cycloocytne-modified hyaluronan (HA-BCN) and a multiarmed azide-modified PEG [p(N3)8]. The BCN reacted with azides (N3) on the 8-armed PEG polymer with terminating N3-moieties to form a stable 1,2,3-triazole. Christoffersson et al. completed chemical reactions under physiological conditions to form the hydrogels with tunable viscoelastic properties. The crosslinking strategy was ideal to fabricate hydrogels for 3D cell culture; as the cells could be encapsulated in the biomaterial without compromising their viability and were suitable for use in microfluidic devices. The scientists used excess SPAAC moieties on the novel biomaterial to attach different ligands including RGD peptides to promote interactions at the cell-material interface. Thereafter, the scientists varied the composition of the two main constituents to understand the resulting viscoelastic properties, such as the storage modulus (G') and loss modulus (G") of the hydrogels via oscillatory rheology (technique to measure the viscoelastic behavior of soft materials). They controlled the gelation kinetics of the novel hydrogel at increasing temperatures. Gelation kinetics of the new biomaterial was slow enough for homogenous cell distribution but rapid enough to prevent cell sedimentation. The ability to control gelation kinetics allowed the scientists to consider a variety of biofabrication strategies (e.g. bioprinting) and hydrogel assembly within the microfluidic systems for organ-on-chip applications. Christoffersson et al. next compared the HA-PEG hydrogels with the well-established 3D cell culture scaffolds - agarose and alginate hydrogels. In order to determine the final viscoelastic properties suited for 3D cell culture experiments, they used oscillatory rheology to examine the different polymer concentrations. The scientists analyzed the composition of the finalized materials using scanning electron microscopy (SEM) images. 1. Allow perfusion (passage of fluid) of cell culture medium across the hydrogel surface for steady nutrient media exchange, to and from the encapsulated hepatocytes. 2. Allow sampling of the perfused media for experimental analysis during ongoing cell culture, without affecting the hepatocytes and the hydrogel. To meet these criteria, the scientists used a commercial 3D cell culture device (μ-Slide III 3D Perfusion IbiTreat) containing two consecutive chambers (2 x 30 µL) in three parallel arrays - each connected to media reservoirs to perfuse liquid. For effective perfusion, they mounted the device on an automatic rocking table by reversing the perfusate direction across the hydrogel-containing chambers. The experimental setup allowed perfusion through the device, fulfilling the first criteria. To fulfill the second criteria, the localized walls adjacent to the hydrogel chambers allowed the scientists to sample the perfusate without interfering the hydrogel or cell constituents. The scientists first investigated biofunctionalization of liver-on-a-chip devices in the study with HEPG2 cells (liver carcinoma cell line) encapsulated in hydrogels, after 3, 7 and 9 days of cell culture. They compared the cell morphology, viability and functionality with agarose and alginate hydrogels. 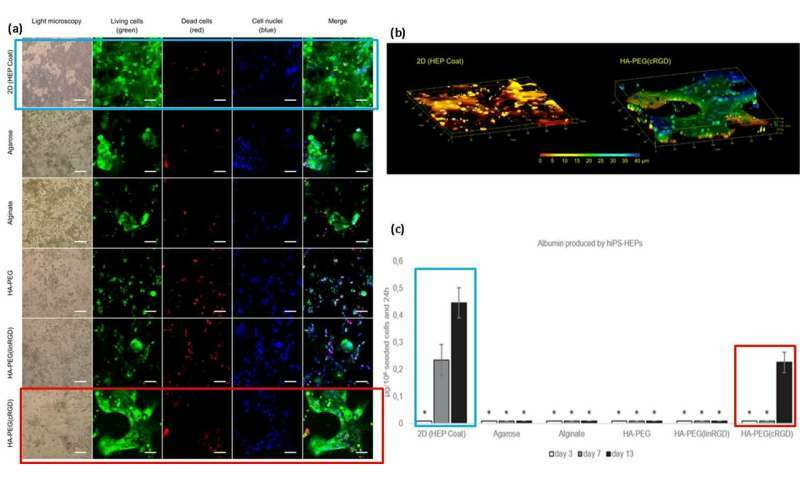 The study included live/dead assays to confirm cell viability and further confirmed HepG2 functionality by detecting albumin and urea secretions in the supernatant of the cell culture. For improved cell functionality (surface attachment and mobility on materials), the scientists grafted cell adhesion motifs such as linear or cyclic RGD peptides (linear linRGD or cyclic cRGD) on to the hydrogels. In this instance, hiPS-HEP cells (hepatocyte stem cells) were cultured across different hydrogel compositions for 13 days to examine the morphology and viability (live/dead staining) after cell-material interactions. The scientists used six different hydrogel-based biomaterial surfaces in the experiments including; 2D (HEP coat), Agarose, Alginate, HA-PEG, HA-PEG (linRGD) and HA-PEG (cRGD). The hiPS-HEP cells encapsulated and cultured in the modified hydrogel grew within 2D and true 3D constructs. To test the functionality of the cultured hiPS-HEP cells (stem cells), the scientists quantified their albumin and urea excretion. The results showed that only the supernatants of stem cells cultured in 2D surfaces and in the presence of the cRGD motif hydrogels secreted albumin. Based on the results, the scientists attributed the higher albumin quantity on the 2D HEP coat to the rate of albumin diffusion within hydrogels; transfer across 2D coat being faster than 3D. The higher concentration of albumin with cRGD motif bound hydrogels, correlated with the increased cell growth and viability observed on the cRGD bound biomaterial surfaces. 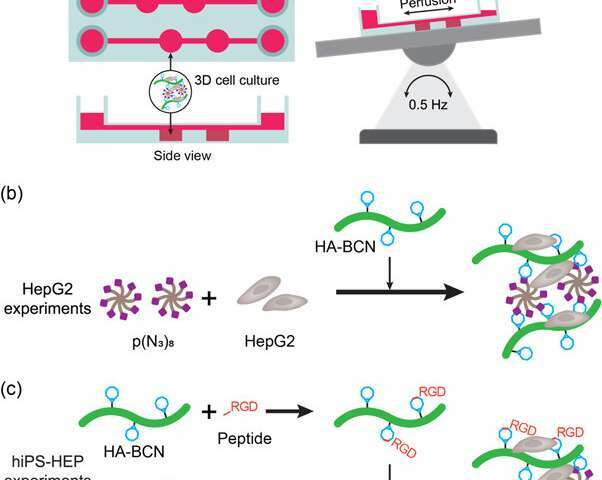 As a result, the scientists intend to use cyclic forms of RGD peptide to assist hepatocyte stem cell culture on hydrogels prepared for liver-on-a-chip devices in the future. In this way, the study detailed the advantages of using hyaluronan-PEG based hydrogel modified with RGD peptides for 3D cultures of hepatocytes (approximating 13 days) in a liver-on-a-chip setup. As benchmarks of the study, Christofferfsson and co-workers used the commonly available alginate and agarose hydrogels. In the future, the scientists will optimize the viscoelastic properties and the concentration of cell adhesion motifs on the HA-PEG hydrogel system for biomimetic cytocompatibility. The optimized hydrogel system can be combined with the device setup to facilitate physiologically relevant liver-on-a-chip platforms for clinical research in drug toxicology, drug discovery and regenerative medicine. More information: 1. Fabrication of modular hyaluronan-PEG hydrogels to support 3D cultures of hepatocytes in a perfused liver-on-a-chip device iopscience.iop.org/article/10. … 088/1758-5090/aaf657, Jonas Christoffersson et al. 27 December 2018, Biofabrication, IOP Science. 2. Controlling hydrogelation kinetics by peptide design for three-dimensional encapsulation and injectable delivery of cells www.pnas.org/content/104/19/7791 Haines-Butterick L. et al. May 2007, PNAS . 3. Microfluidic organs-on-chips www.nature.com/articles/nbt.2989 Bhattia S. N and Ingber D.E. August 2014, Nature Biotechnology. 4. Organs-on-chips at the frontiers of drug discovery, www.nature.com/articles/nrd4539 Esch E.W. et al. March 2015, Nature Reviews Drug Discovery.